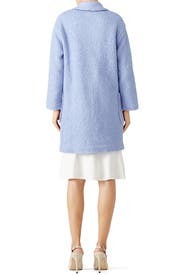 This blue coat by English Factory adds a fresh element to any look. Wear it with the Flame Red Medium Rider Bag by Loeffler Randall. Blue knit (55% Wool, 45% Polyester). Long sleeves. Jacket. Exposed front button closures. Fully lined. 35” from shoulder to hemline. Imported. 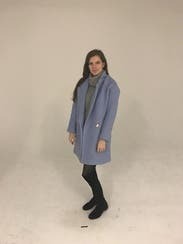 Warm and cozy in a beautiful periwinkle color. Not a super flattering fit but I would rent again. 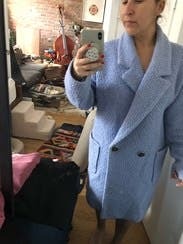 Highly recommend this over size fitted coat! Great upgrade to any outfit. I️ received a ton of compliments on the color and the softness. I'm even considering purchasing. Love it! I have runt several out clothes from RTR before, but most of them looks too mature for early 20s. This piece is not expensive in price, however turn out to be my favorite clothes so far. 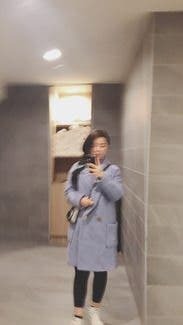 Not only because the baby blue is attractive between all the black and gray in winter, also the length is just perfect. And the last thing is, you can use a pearl brooch to light up your total look. Love this coat! So warm and the color is gorgeous. Difficult to go anywhere without receiving compliments on it. I'm usually an XS, so this was a little big for me; but a cute oversized look with lots of room for a big sweater underneath. Cute. Rented it because of the color. I had to go to Atlanta for work. This was great for the cold wearher. Loved that it was professional looking but still fun. Got TONS of compliments too! I could have probably gone with the XS. 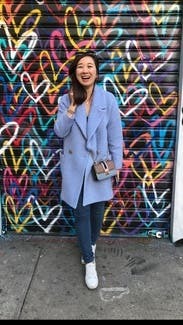 Great coat that stands out from all the grey and black! Second month I've rented it! Fits true to size but has room for a sweater or jacket under. I fell in love with this coat the moment I laid eyes on it at the NYC flagship store. I get compliments from women of all ages whenever I wear it. Given that it's a lighter fall jacket, I wear a Uniqlo jacket underneath so I can keep wearing through the winter. I decided to buy it and haven't looked back! Love this coat but it does run large. I wish I had sized down. Even so it doesn't look bad. 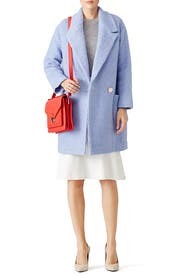 I'm only 5'3 so this coat pretty much ate me up, but the color is BEAUTIFUL! I wanted to buy it so bad. And if you rent it I think you can buy it for around 50 bucks. Unfortunately my friends and family thought the material resembled carpet (I mean they're right but...anyways). It's a little old school and pretty big so just be wary of that. If I didn't live in Arizona I'd absolutely get this though! I loved the color. A perfect shade of periwinkle. It runs large but looks fine oversized. Especially if you leave it open. My jacket looked a little worn. 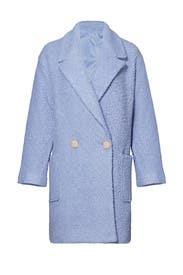 This coat has a very lovely blue color that stands out in the crowd. You can wear something simple and have this coat over it, and you got yourself an eye-popping outfit. It does shed and you can see it more clearly on darker outfits - like my black pants. The coat is very comfortable, has quality materials that create good warmth for a late winter, and deep pockets was definitely a plus! My only issue was that it came in a plastic bag and the small envelope they sent me to return it, obviously would not fit ONE let alone TWO of the coats!! Just fair warning as not everyone lives close to a store and you would have zero way to return it. I mentioned it to the store, and they seemed to not care. So peeps- just FYI if you don't live in a major city. 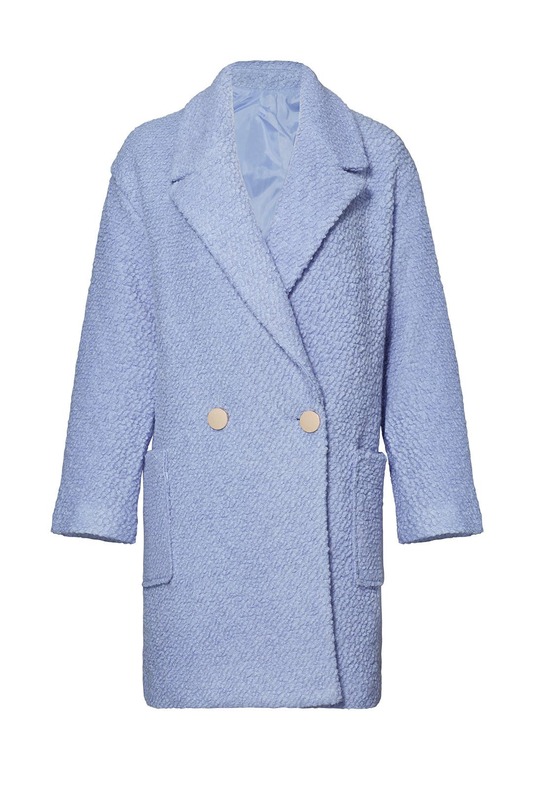 I loved this addition to my winter coat rotation with the soft periwinkle. Pop the collar up or down depending on the vibe. Being fully lined it was super cozy. I’m wearing a small which worked well with the chunky sweater I was wearing under it. 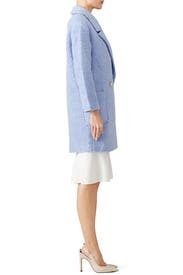 This coat would work with all body sizes and has plenty of room throughout the waist. 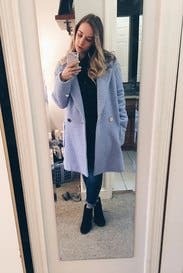 Wear to work or to a date night, this coat definitely makes a cold day a little more colorful!! Absolutely perfect! Warm, cute, soft, gorgeous. Pros: - Perfect for everyday wear! 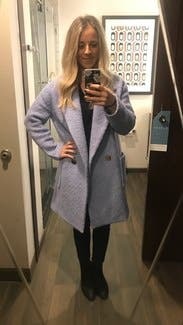 Comfy, warm, great texture outside and smooth and soft inside - Stands up to the weather (I'm in NYC) - Already getting compliments from everyone who's seen it (including my fashion clueless boyfriend) - Beautiful color. Absolutely true to photos Cons: - "Small" size made for someone small everywhere. It fits exactly how I like (loose but not swallowing me) except the sleeves are super short. But then again, I'm a little over 5'8" and my arms are super long so that's normal for me! I loved this jacket so much that I ended up buying it. It's become a staple in my winter wardrobe! The color is beautiful and it keeps you nice and warm. I get compliments on it all the time! I opened the bag and saw that this looked like a very quirky sofa and immediately liked it. Once on I adored it and bought it. It looks great with sweaters, t-shirts, and pretty much anything. 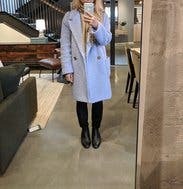 I ended up purchasing this coat - the color is so fun, and is really fun to add to my rotation of mainly black/grey coats! Not the warmest coat, but perfect for layering over a sweater or on mild fall days. I enjoyed wearing this color in the colder temps.